Looking North 130k to go to Skeffington. Didcot then Oxford can be seen. Couldn't resist the pic. THE day of the Year? Jim and Dave-C's early morning email comment about today having great potential certainly turned out to be correct. Several declared and completed 500k's plus lots of other bimbling around to be had. Visibility was excellent and cloudbase went up to around 6000' in parts. Pity the ladder is out of action for a few days because it'll be really interesting to see what flights were achieved in such fantastic conditions. 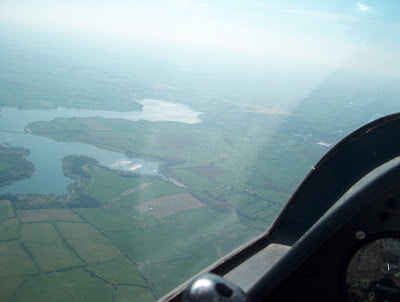 I did a 'local soaring' flight in K-21 KCZ of BOB-DID-BIC-BOO in a leisurely 1 1/2 hours, accompanied by G-DDXX/580 flown by Ben who'd originally planned a 300k task but had electrical problems. Even Gerry went cross-country in one of the Juniors, achieving BOO-DID-BOO and then did it again I think. Everybody completed their tasks today so we finished off with a quiet drink at The Pad watching the balloons making the most of the now calmer conditions. Then suddenly an interloper arrived in the form of Lasham-based DG100T G-RYPE/E6. Apparently the 'T' part of a DG1000 only works when the batteries are charged! Anyway, they joined us in the bar (drinking orange juices!) until their rescuer, in the form of Bob Bickers flying Rallye tug G-BSFF arrived. First shows an horrendous looking fire between M4 and Welford. Good wind sock though. Second taken a few moments later, looking along the street. M4 on right and A34 on left. Well today was definately better than Monday. Got to the airfield around Midday as Z3 launched (no idea where Tim went) but needed to sort my ballast out before flying. This gave Mike and the bronzers time to change ends to put the launch point conveniently close to my trailer. Finally got the water in by 2pm and launched on a 250 BOB-RIV-NOS-DID-BOO. The sky had developed nicely to the West and was streeting a bit but looked very blue in the North. I set off on the task never-the-less. 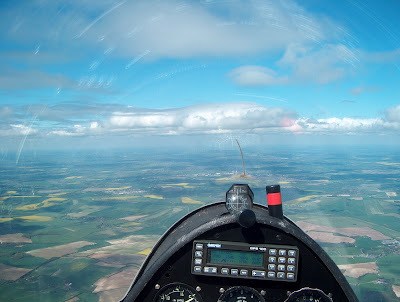 Good run down to the M4 at Welford into a light SW breeze with cloudbase about 4000ft. The sky then went a bit woolly. Couldn't tell if it was the approaching cirrus or just over development but I rounded RIV low and got lower. Desperation took me into the sun and I got a weak climb over a farmstead near Hungerford and got away. 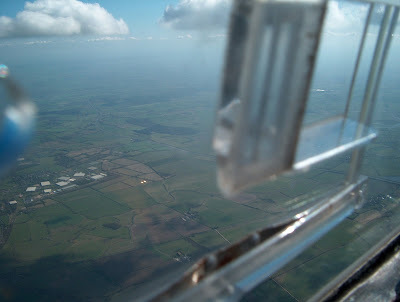 Another climb at Wantage and another at Abingdon got me back to cloudbase. 250k declared task achieved at 85KPH late in the day so I was pleased. The bronzers were still playing. Yan had landed out safely at Stokenchurch without doing his field landing checks first! He is now current on field landings! Several of the chaps had gone to get the glider. I guess that will be an expensive round, Yan? Evening flying was underway as I left for home. See you at the weekend. More in hope and with a glider pilot's optimism I arrived at the airfield with a 300k in mind. Corby South-Bullington and home. There was a lot of cirrus about and once again lovely cu under the TMA but it looked very blue and murky towards the West. It was obviously great weather for a Bronze course, on which 5 members were getting used to the Junior and Pegasus, field landings and managing Bronze legs, but not the sort of weather to be pushing off cross country. Around 11.30 cu started to appear to the South of the airfield and then a little later to the West, perhaps it would be a good day after all. I decided to keep to my original task and launched along with 246 Brian. The climbs seemed reliable and the track to the North seemed full of good looking cumulus so I started around 12.16. Whilst the vis wasn't exactly great it was enough to pick a path along a cu strewn track. Passing Aylesbury I could hear a group of 4 gliders at Bicester planning the task Bullington-Hus.Bos. So that would keep me informed of the Southern half of my task. I couldn't see it but it was blue at Bicester by then. Although I could see that to the South it looked blue. I hoped this would change by the time I reached that part of the task. Little did I know!!!. At little Horwood the sky ahead turned blue but the cu were still in abundance from Northampton on so I decided to continue. In the blue it was rather like post sea breeze with rather weak broken thermals. Never mind the sky ahead still looked full of promise. At that point Brian said he was calling it a day and giving up the task. As I glid North the good looking cu kept disappearing from 'before my very eyes' and a slight tinge of doubt crept into my mind. Keep to the towns and it will be OK I told myself. 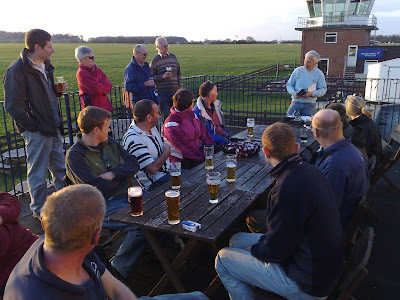 Meanwhile I could heard the Bicester group discussing tactics and sharing info on where the thermals were and strength. A group in the blue is always better. At last just short of Corby a cloud stayed and worked. Round the turn and now what? It looked grim into sun and poor vis. Back along the edge of Kettering which just gave bubbles and then into wind which was a reasonably fresh Westerly... a little village between Kettering and Pitsford grew larger as I descended then sure enough pushed a bubble off enough for me to turn in. I stuck with this until nearly 4000ft although I never made any sense out of it and couldn't stay in the core for more than a couple of turns before having to make major adjustment. On towards the Western edge of Northampton..Via the village on the Western edge of Pitsford Reservoir. by the time I was approaching the M1 my height was beginning to get worrying and fields were on my mind but the large white storage warehouses alongside the M1 had rescued me on several occassions in the past so it was worth a try. After a lot of searching eventually another broken but strong climb carried me aloft again. On to Towcester another broken climb. Now I could hear the Bicester group discussing giving up at Bicester as they took a climb near Didcot. And talking about the great looking cu to the west. Which I had been aware of for a while, but what use are cu 50 miles away. As I glid past Sivereston I thought "Well at least I'm now able to get to Bicester myself". Then it was as if someone had drawn a curtain. The vis improved, it felt warmer and a good strong climb took me to 4000 no trouble at all. At Bicester whilst climbing I watched the Bicester group finishing and landing. I decided that, with an obviously different airmass, it was worth seeing how much further I dared go without risking a landout. 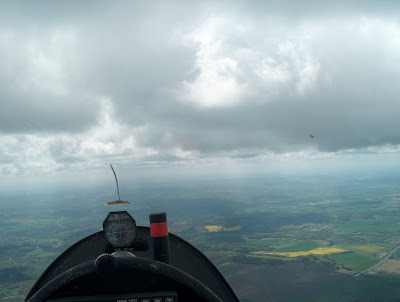 Gliding towards Oxford North (trying to make sure I could use it when putting the task on the ladder (as an undeclared task) it looked as though the cu were steadily increasing from the West. Across Oxford towards Cowley and a cracking climb to 4000+ ... next point Didcot... At Didcot the moment of truth. Looked at my watch. Discretion took over "Go home don't be silly". Interestingly the cu reached High Wycombe and were still there whist I was shopping at 19.00hours. Perhaps it would have been on after all. Calum and I met before 9 to rig and pair fly a decent sized task (for us! ), in the expectation of a booming day. Unfortunately a strong, cold wind was blowing and the sky didn't look very promising, so we watched the rain soaked Chinese Grand Prix and then helped rig the Duo and the Graham's Petrel at the launch point. We couldn't get the enthusiasm together to fly 314 and 208, so we tried to think of ways to usefully use the day. As such I did a conversion training session on the Super Cub with some excellent training from our new tug master Andrew Betteley, whilst Calum got some hands on time with our Duo Discus, 315. 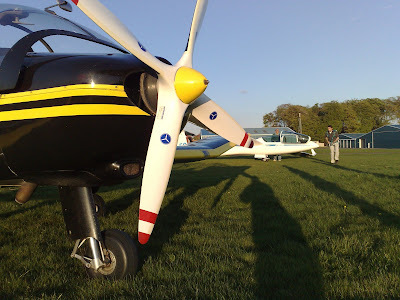 Following my entertaining tail dragger training I hopped in the Duo for both back seat and front seat conversion flights with Steve Williams, who then very kindly sent me off solo in 315, in the beautiful and nicely thermic early evening sunshine soaked sky. In true stone-like fashion I spectacularly failed to find any lift and thus executed possibly the world's shortest ever Duo flight. However, I did achieve a significant goal of flying the Duo solo, which I'd been hoping to do since I started gliding back in 2005. Before heading to the bar I discovered a flat tyre on my car, which taught me not to hurtle round the perry track too fast! Thanks to Emily, Doug and Will who helped me jack up my car and change the wheel. The evening was rounded off with a couple of refreshing sunset beers with several club members on the balcony of The Pad. A really rewarding day's flying despite the soaring conditions not being up to much. RASP had given cloudbase at 2500 rising to 4500 eventually with the best area starting to the North of Booker and growing into East Anglia. Eventually covering a large area over the South of England. It seemed like it would be on for another 400k attempt. Eventually I settled on Mursley Water Tower/Littleport/Avebury. The day didn't seem to want to clear but around 11.30 the sky organised itself into streets and gaps which looked exactly what I'd been expecting. So I took a launch pulled off and climbed to cloudbase which was 2600asl. Vis wasn't good but I could see streets lining up off the ridge which I thought I'd fly to and then into wind to my first TP. Until I left the hills the lift seemed around in abundance and I didn't see any need to top back up to cloudbase (one couldn't see what was going on from there anyway). Once the ridge was behind me I glid towards Haddenham Thame which seemed like a safe haven if it didn't work. In the event it turned out to far away so the strip East of Thame and South of the railway line beckoned. A last scratch over the farmhouse to no avail and into the strip. Wind was not down it but off about 85degrees but with the new rules at Wycombe Airfield that is something everyone has to cope with. After letting the office know I was down and would be looking for an aerotow if possible once the fleet had been launched. I was met with 5 children of various ages on bikes and a black labrador with a grown up walking along behind. It turned out 'grown up' worked for the owners son who would be out in a minute or 2. The owner (or rather the owners son) who now ran the farm came out. I did the usual apologising for landing etc and then asked if an aerotow would be OK. His reply was "It will be the quickest way to get it off". He said the Jodel had taken off just before I'd arrived and might be back. So I said I'd move the glider off the strip if it rejoined. When I asked the name of the farm which I'd asked him to repeat I thought he'd said Severals Farm. (It turned out once I checked at home it was called Shrove Furlong Farm). He then left me to it, seeming that the sooner it was removed the better. My phone then rang and it was Brian Forest asking if I'd like a road retrieve. (Thanks Brian much appreciated). But if possible I wanted an aerotow retrieve. Now left to my own devices I tried to move the glider. It wouldn't budge. At that point 2 lads came back on bikes and I got them to help move it onto a narrow metalled track that ran for half the length of the strip. Along which I was able to move it by myself. Once at the end of the hard surface I was stuck. Phone rang again, this time Andy Betterly asked for lat/long and said he'd be with me in 15 mins. Wonderful. His short field landing was brilliant and we used the tug to move the glider to the start of the strip. My worry was the wing dragging on the grass with hedges either side, which included wire. Sure enough once the tug reached the end of the rope (all 100ft) of it the wing went down. Andy held the Pawnee on the brakes then went for it. The next 10 seconds were the worst 10secs of my life the glider swung towards the hedge and the gap closed rapidly. If I relased I'd be in it, so I took the risk of the wing picking up in time and held on......... ...... the wing came up and a boot full of rudder swung the glider round how much space there was between the hedge must have measurable with a feeler gauge. I can do without to many heart stopping moments like that. The trip back to Booker was uneventful and the grid was still waiting to be launched. Thanks again to Brian for the offer of a retrieve and to Andy for a great aerotow out. Not quite a 400k but and eventful day nevertheless. Roll on tomorrow. Scheduled to take place on Saturday 11th April, Graham Saw organised the annual aerobatics competiton to take advantage of the Easter period. The weather didn't play ball, so the event was postponed until the following day...whereupon it was then postponed until the day after as the clag refused to lift and the cloud remained resolutely near to the ground. So, we actuslly ended up flying it on Monday 13th. Just as well it was a Bank Holiday really. Graham persuaded Phil Atley, a BAeA Aerobatics judge with experience of judging both power and gliding, to be this year's Chief Judge. Phil spent several days at Booker patiently waiting for the weather to improve - 10/10 for perseverence. For the competitors this was a great opportunity to be scored and critiqued by a top judge. 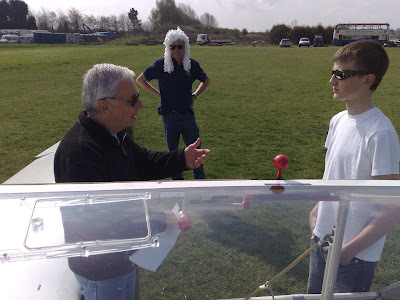 The photo below show's Phil taking his Judging role very seriously - even critiquing Graham's pre-flight briefing with Will. The day was slow to start but by 12:00 it was clear that it we were going to have great aerobatics weather and it looked rather decent for cross-country flying too. We ended up doing 14 aerobatics sorties, interspersed with cross-country tasks, trial flights, training and type conversions too. All good fun. The aerobatics were flown mainly in K-21 KCZ with one pilot electing to fly in a K-13. Special good effort award goes to Jon Gatfield who went off on a cross-country task in his ASW27 (and then did a second task I think as the first one was too easy). He then flew the aerobatics sequence upon arrival back from doing a cross-country flight, being talked through the sequence over the radio. 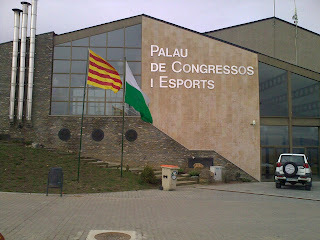 Cudos! Will's place as winner is all the more impressive considering that he's 15 (yes, he did have a 'safety' pilot with him) and he's never practiced glider aerobatics before (althouhg rumour has it that he's quite adept at aerobatics in a Chipmunk). So, another fun day with lots of variety. Graham did the prize giving session on The Pad's balcony, which allowed us the opportunity to relax over a beer with the sun setting in the background. A great finish to a fantastic day - if you weren't there - what did you do today? Turned into a really nice day flying. T6, GA, Z3, G1, and myself set 145k BOB-BUC-CHV-BOO thinking the day would go to worms. As it happened we really flew round getting back to BOO at 2000ft and 96KPH to do another task. I think Tim was bit lower! Set house triangle BOB-BIC-DID-BOO. Cloudbase now over 4000ft and great climbs so bashed off together on what turned out to be a record trip for me at under 50 mins for the 100K triangle. Z3, Z12, and T6 all finished together for a very nice flight. The club was having its Easter Egg aerobics competition so it was necessary for T6 and Z12 to climb up once again for a little freestyle circuit! After such a naff Easter weekend today was a real treat. A little late, but one more posting from Spain. 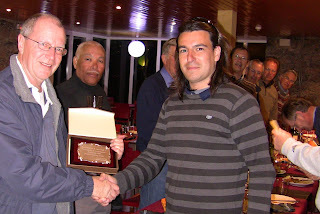 La Cerdanya Gliding Club Manager Xavier Jove expressed his gratitude to visiting club members by presenting each club with a gift at the group dinner last Thursday. The photo above shows William Parker receiving an engraved plaque from 'Zavie'. I know that all of the Booker members who visited La Cerdanya had a great time, and on behalf of them all I would like to thank Andy Roch from LGC and William Parker for all their hard work in making the expedition such a success. Lets hope for a similar trip next year. Until then Hola from Manuel Fawlty. PS I've no idea who those dodgy looking characters in the background of the photo are. Arriving at the airfield a little earlier than my norm I was surprised how windy it felt. Bob had rigged already and the problem became how big could we risk setting. A 500 seemed to much and a 300 to little so 400 it was to be. Booker Bridge-Marlborough-Oundle-Broadway-Booker. 406k. When Bob and I were off tow AJ arrived and asked the task and thought he'd have a go as well. 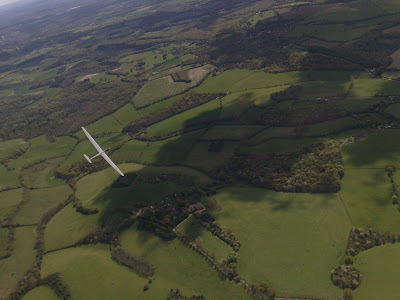 We set off with a cloud base of just 2800 along reasonable cloud streets, the wind didn't seem to much of a problem, except AJ once again found his nemesis around Membury (no problem with an engine) so he went back to start another task. Oundle-Evesham. The run to Oundle for me seemed quite difficult but Bob romped along and turned whilst I was still 20k short. By now the cloud base was around 5500 asl with good tight climbs of 4-6knots when you could find them. If you didn't find them then one ended going backwards. It was on this leg it occurred to me that setting a leg under the Daventry Airspace at FL45 wasn't clever. Just south of Daventry Bob found himself out of it and eventually made a landing at Bicester for an aerotow retrieve. By the time I reached Banbury I was beginning to have doubts of ever reaching Broadway as the streets were disappearing, as were the cumulus. 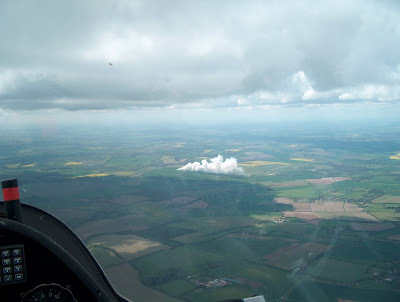 After a climb over Shennington I was ready to give up when what appeared to be a strong cumulus formed over Honeybourne A/F (disused) this gave me a strong climb to 5500 and allowed me to push round Broadway and glide out on the way home in the blue. AJ who had turned Evesham and then contacted the wave climbed to 8000 and had a lovely glide home. In the blue just North of Little Rissington a weak climb and another stronger one off Blenheim Palace allowed me to glide to the cumulus which were still forming to the East of Kidlington and onwards to Booker. It was some day with just 2minutes short of 7hours flying time 6hours 21 mins on task. By 1000 it looked quite good so I thought it would be worth a punt before the showers got going. Arriving at the airfield much later AJ's parking space was empty so he'd obviously felt it was worth doing something. JFK was ready to tow out and that was it from a cross country perspective. Julian and Glen were looking after the members requiring instruction with a K13 and a K21 and a Junior was parked waiting for a customer. I'd decided to try a double shuffle Marlborough-Thame Church-Membury and back to Booker. This gave the option of calling it day if the showers got going strongly which was on the cards. A launch straight into a cracking climb and up to the bottom of the airspace 4000 and a start. AJ then asked my task and said he was trying Membury-Northampton South. A cloud street lay ahead and gave a great run towards Welford which just before I reached the A34 AJ came steaming over the top of me. A climb and change to another street and it was looking good to keep going towards Marlborough. At that point AJ said it was raining on him, which was strange as I couldn't see any sign of rain from my vantage point. Another good climb south of Membury and the clouds ahead looked as though they were going to let go of rain at any time. AJ then said he'd landed out. (started his engine) so that was it for him. Pushing on along the street which ran to the south of Marlborough I was eventually able to turn Marlborough in sector but quite a long way south and past the turn. It seemed silly to leave the comfort of the street I was in. The sky suddenly started to look really well organized and the threatening cumulus seem to turn into well behaved clouds. On the way to Thame Z12 asked about conditions and was taking a launch. After rounding Thame and again running into wind under superb streets it was a joy to be in the air. Then Jim said he wasn't achieving very good glides "How was I finding it" I had to say that the streets were being very kind to me. The rest of the flight was in a similar vein and most enjoyable. After downloading the flight onto my computer I was amazed to find that the glide angle achieved for the whole task was 76.2. That's how good the lift under the streets was. Hope we can have as much fun tomorrow. Launched just after midday in 208 and spent 40 minutes or so getting used to the glider again as it was my first flight since Aboyne in October. My pair flying partner, Calum in 314, was delayed launching due to changing wind conditions on the airfield. We started at 12:50 and flew to Broadway via Thame without any difficulty. 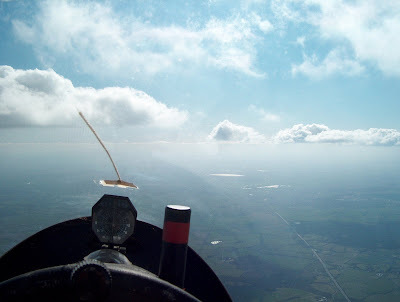 Cloudbase was about 4200ft and thermals were regularly available and pretty reliable. Coming out of Broadway I was overconfident and charged out at 90kts. A few minutes later at 2000 I was regretting burning so much energy and we spent about 20 minutes scratching to the west of Banbury. Calum started to head home but I got into a stronger climb and decided to continue to Northampton South with Hannah in CH. The run to NOS was very easy and at one point I had 5.7kts average flying straight for about 2 minutes! Heaven. On the way I heard Calum land out at Souldern and I promised to retrieve him upon my return to Booker. NOS to BOB was a different story there was a small patch of sunshine at Thame, which saved me from landing out (read turbo-ing home) and a small thermal at the ridge, which put me comfortably over final glide. The last leg made the flight a real challenge it looks like night over Booker the top cover was that thick (slight exaggeration perhaps). 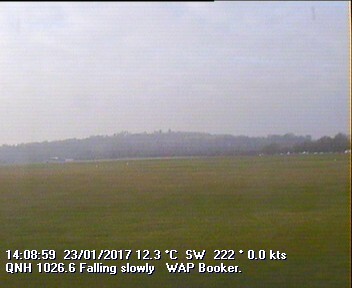 I landed at 17:00 for a speed of around 52kph (212km)! I need to try harder. I also actually really enjoyed my first solo retrieve to get Calum and 314 out of a field near Souldern (40 miles from Booker, near J10 of the M40) and was handsomely rewarded with a curry in High Wycombe later that evening. Dusting off my thermalling skills over High Wycombe before starting BOB-BRO-NOS-BOB. Waiting for Calum in a thermal at cloudbase somewhere between Thame and Broadway. I was practising winding the speed up in order to launch out of the thermal rapidly. You can see Calum in 314 fifteen hundred feet or so below. Thermalling with Hannah in CH at the start of the very difficult leg from NOS to BOB. I call this clip 'Four Horsemen of the Apocalypse'. 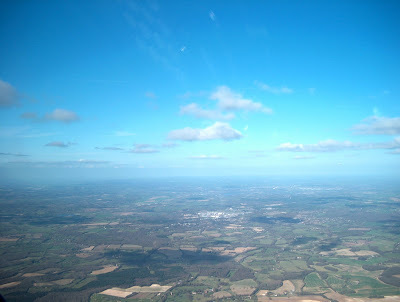 This was taken between Northampton and Thame when I was flying due south. To the left, under the dark overcast sky is home, to right and ahead is some nice sunshine. I carried on as far south as I could before turning left for Booker. I only just made it home and was very pleased to make it around the task. A really beautiful shot of the rays of sunlight shining through the gaps in the dark clouds. About to de-rig 314 in a field just past Souldern (J10 M40). Calum safely down after his first ever field landing. Congratulations on an excellent piece of field selection. However, you should have checked if the gate was unlocked before landing! 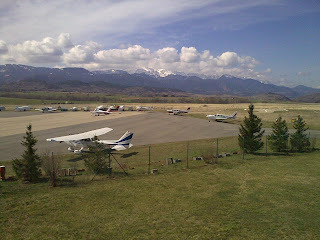 Overall, a really great day's flying, especially for the beginning of April. Incredibly another 300k day at the weekend. 918,Z3,A9,EN,949, 246, CH, 314 and 208 all launched with a view to doing a cross country. Either the 300 that Matt had set of BOB-BRO-OUN-SW1-BOO or BRO and NOS. for the less experienced to test their skills. The launching was a little delayed by the wind not being along the airfield manager dictated runway but eventually all got away. The day was very good with strong cloud streets (even if not actually on track, unless it was the way home), good embedded climbs (which eventually reached 5000 above Booker) and not very much wind (a pleasure after yesterday). The shame was that for a change RASP was correct and the day deteriorated from the South which somewhat spoiled the run back to SW1 and BOO. I heard 314 land out and know that Jim (flying 208, with a get me home if it goes wrong option) was going to retrieve him. After I'd landed Brian (246) finished then Matt(A9) arrived followed by Tim (Z3) and then Hannah (CH). That left Geoff (949) and Niels (EN). I see from the BGA ladder that Geoff got round OK but nothing from Neils. Hope he managed to get back OK. I'm know that those members that didn't go cross country but remained at Booker doing the tugging and instructing did an excellent job as always despite the difficult situation on the airfield. A Xcday at the weekend. The forecast had said the front wouldn't clear until midday. Typically the forecast is hardly ever correct. Even so it probably mean't a lot of pilots didn't make the effort to be there today, which was a shame as it turned out to be rather good even if the wind did make life difficult at times. By 11.00 ish. when I arrived on the field Tim Scot and Bob Sinden were rigged and Tim was going to do an AAT which I believe Bob felt would be a good idea. I'd fancied an O/R to Ludlow but was talked out of it by Alan Johnston who arrived shortly after me and felt a Corby Bullington was better. I convinced him we should do it the other way round and so that was our task for the day. Jim White and Dennis then arrived and had a double shuffle in mind to Blandford Forum and the back and out to the West again. After scrabbling to get high enough to start Alan and I did get going around 11.50 and it proved to be an interesting day with a Westerly wind around 17knots at flying heights. The highest I climbed was 5500asl around Bicester and the strongest thermals was a good 5knots. Picture below is looking towards Booker from Bicester. The last picture is the way home from Bullington. Hope these give a little idea of what it was like for all those that didn't make it today. Let us hope that their are many more such days. We'll be thermalling today. Another photo from the bar at midday today showing the thermals popping over the Sierra Del Cadi. The Spanish weather has not been entirely on our side recently, Thursday was a rest day and for Friday we had mainly weak thermals with one area of the valley producing strong climbs to 9k. Richard Clarke converted to the k23 and Chris C filled in his completed silver badge claim. 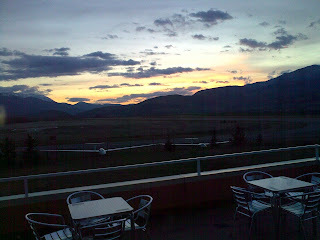 All too busy flying for photos, but here is a sunset photo from the control tower bar. Woke to the sight of rain at one end of the valley and sun at the other. Today was a classic example of the wave blowing the bad weather away. Chris c 987 13.5k. Barry M JDV 8k. Richard C Willam P 13k. Bob s 8k. Jane M 8k. Dave CB 8k. Many of us flew twice. Wlliam also flew the k23 for 8 minutes but it doesn't look like the relationship will last. This list of height gains does not do justice to the stunning views we saw today. The day got off to a flying start when the local town mayor, having opened the new sports centre, came to the airfield. Sr. Juan de Abril told us that in order to encourage expeditions by UK and German clubs to Cerdanya, all flying for this week will be sponsored with an EU sports development grant for Catalunya. Looks like we picked the right week! Now all we need is the weather, and some more of those 10Kt climbs.